This courtroom sketch depicts defense lawyer Kevin Downing questioning of Rick Gates, as former Trump campaign chairman Paul Manafort (bottom front left) listens. Paul Manafort's former business partner Rick Gates concluded three sometimes punishing days of testimony in Manafort's bank and tax fraud trial on Wednesday as prosecutors and defense lawyers battled over his credibility. Gates spent the early part of the week corroborating prosecutors' version of events, but Tuesday afternoon and Wednesday morning, he endured a bruising cross-examination by Manafort's defense that touched on his admitted financial crimes and an extramarital affair. Gates, who spent years as Manafort's right-hand man, says he and Manafort used offshore bank accounts and wire transfers to hide money from the IRS to avoid paying taxes. Prosecutors also say the men falsified documents to lie to banks to qualify Manafort for loans. Manafort is charged with 18 counts of bank and tax fraud, and his trial in Alexandria, Va., is the first to result from indictments brought by special counsel Robert Mueller, who is investigating Russian interference in the 2016 election. Gates has pleaded guilty to similar charges in exchange for leniency as part of a deal with prosecutors that put him into the position of testifying against his former boss. Manafort's defense team says it was Gates who committed the financial crimes, without Manafort's knowledge. They argue he manipulated Manafort's finances so he could line his own pockets. Gates has admitted to embezzling from Manafort, but he says he helped Manafort evade taxes and lie to banks — at Manafort's direction. In cross-examination, defense lawyer Kevin Downing guided Gates and the jury through a wide array of lies Gates has acknowledged and crimes he has committed. Downing sought to paint Gates as a man who can't be trusted. Gates testified Tuesday that he had an extramarital affair a decade ago and that he embezzled hundreds of thousands of dollars from Manafort. On Wednesday, Downing seemed to indicate that Gates had more than one affair. Downing asked Gates about whether he, in cooperating with special counsel investigators, told them "that you actually engaged in four extramarital affairs?" Prosecutors quickly objected. After a brief conference with Judge T.S. Ellis III, Downing instead asked if Gates' "secret life" encompassed the years 2010-2014, to which Gates answered: "it did." The affair Gates testified about on Tuesday lasted for around five months in 2008, he said. As part of his plea agreement to cooperate with prosecutors, Gates also admitted to lying to investigators from the special counsel's office — a fact Downing has also seized upon. "This jury is just supposed to believe you after all the lies that you've told and the fraud you've committed?" asked Downing on Tuesday. "Yes, because I'm here to tell the truth and take responsibility for my actions," Gates said. "Mr. Manafort had the same path. I'm trying to change." While the defense's strategy seemed focused on destroying Gates' credibility in the eyes of the jury, prosecutors built a document trail that corroborates testimony from witnesses, including Gates, so their case is not reliant only on him. On Wednesday, they got another chance to question Gates after the defense completed its cross-examination. Prosecutor Greg Andres focused his questions on the fundamentals of the case — the bank and tax fraud charges, including failure to report foreign bank accounts. Andres walked Gates through a set of questions, having Gates repeat that he and Manafort had offshore bank accounts, including in Cyprus. Andres asked Gates whether he had reported those bank accounts to the IRS, and when Gates said no, Andres asked why. "Paul Manafort directed me not to," Gates said. Andres asked whether it took an expert to know that Cyprus is a foreign country — Gates said no. Andres asked whether it took an expert to know that the accounts Manafort had there were bank accounts — Gates again said no. Andres also had Gates rebut a point the defense had tried to make: that Manafort and Gates were not trying to hide their offshore bank accounts because they disclosed them to the FBI in an interview in 2014. Gates had testified that he did tell the FBI about the accounts, but he told Andres that the FBI did not ask whether he and Manafort disclosed them to the IRS. So while he told the FBI about the bank accounts, he did not disclose that they were not paying taxes on the income flowing through them. Gates testified for a total of about 10 hours this week, before his testimony ended around 11 a.m. Wednesday. Prosecutors then called to the stand an FBI forensic accountant, Morgan Magionos, and an IRS revenue agent. Their testimony was part of a broader strategy by the government to use documents and testimony from those familiar with Manafort's finances to prove fraud and intent, as opposed to relying only on the word of Gates. During Magionos' testimony, the jury was shown emails sent by Manafort to the staff of the lawyer Manafort had engaged in Cyprus. Prosecutors say Manafort and Gates used the lawyer as a middleman to make financial transactions so their names would not be involved. In the emails, Manafort explicitly referenced wire transfers he wanted made involving his overseas bank accounts and shell companies, and he referred to the accounts using the word "my." The government spent last week calling to the stand accountants who worked with Manafort and vendors who testified about how Manafort paid for his luxury goods, including cars and custom suits, by using direct wire transfers from secret accounts overseas. Those who dealt with Manafort's taxes said that when they asked Manafort whether he maintained any bank accounts overseas, he told them no. Cindy Laporta, a tax accountant for Manafort, testified Monday under immunity that she helped file falsified bank loan applications for him even though she knew they were inaccurate. She said even though she worked with Gates a lot, it was clear to her that Manafort "knew what was going on" in most instances. That is important to prosecutors, who need to prove not only that Manafort skimped on paying millions of dollars in taxes but also that he did so with intent and not by mistake. The prosecution's star witness in the case against former Trump campaign chairman Paul Manafort got hammered by the other side yesterday. During cross-examination, Rick Gates revealed that he had lied and embezzled from his former business partner. Today, the government got its chance to undo some of that damaging testimony. NPR's national Justice correspondent Carrie Johnson has been covering Manafort's trial on tax and bank fraud charges. She was in the courtroom in Alexandria, Va., today. And she joins us now. Hey, Carrie. CARRIE JOHNSON, BYLINE: Hey, Ailsa. CHANG: So how did prosecutors do today in trying to rehabilitate Rick Gates from some of the pain the defense inflicted on cross-examination? JOHNSON: Yeah. The government needed to kind of restore some sense of credibility to Rick Gates today. And they had him go through some essential elements of his testimony. Today, from the witness stand, Rick Gates reiterated that he engaged in financial hijinks at Paul Manafort's direction. And he pointed out you didn't have to be an accountant to know that Cyprus, where these men held many foreign bank accounts, is a foreign country. And of course that should have been disclosed on their tax returns. Gates also testified when the FBI first approached Manafort and Rick Gates years ago to ask about some money that had been looted from Ukraine, Manafort had Gates meet with a Ukrainian businessman to give him a heads-up. Now, as for the money that Gates embezzled by padding his expense accounts, Gates testified today the Ukrainians are the ones who paid those bills, not Paul Manafort. CHANG: Now, Gates has spent more than nine hours on the witness stand over the past three days, right? I mean, who did he help more over those (laughter) nine hours, the prosecution or the defense? What's your opinion? JOHNSON: Denting Rick Gates' credibility was the chief goal of the Manafort trial strategy. In fact, it may be the entire Manafort trial strategy. Today, they once again brought up his extramarital affairs - not just one, but defense lawyer Kevin Downing claimed that Gates had four of them today in court. He appeared to be barred from introducing more about that by that judge. Of course, the defense is trying to make this whole case about one witness. But the prosecutors had several accountants testify, had a bookkeeper testify that Paul Manafort was savvy, very involved with his money. Today, prosecutors introduced emails from Paul Manafort himself directing people in Cyprus to transfer money from what he called my accounts there. That evidence flowed in throughout the morning. And the jury took close - took careful notes in their black-and-white composition notebooks. They were paying a lot of attention to the government case today. CHANG: So a lot of evidence beyond the testimony of Rick Gates. Now, the government called an additional witness today. Tell us who that was. JOHNSON: ...The designer clothing? This was all income the prosecutors say should have been reported on Paul Manafort's taxes. We literally followed the money, Ailsa, all afternoon as prosecutors tried to put together the whole picture. 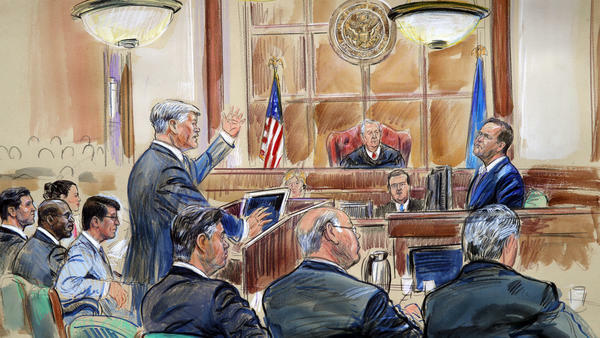 The jury also heard from a 34-year veteran of the Internal Revenue Service. He said he looked at all these financial statements and tax returns. He found several payments were made directly to Paul Manafort's wife, Kathleen. One payment went to pay a bill for a cosmetic dentist. That was new. The point is Manafort could control where the money went, and it was his money. And he should have reported those foreign accounts on his taxes. CHANG: And really quickly, what's the atmosphere been like in the courtroom as the prosecution's been approaching the end of this case? JOHNSON: Very tense. The judge again clashed with prosecutors today in front of the jury and outside. The judge has been rushing these prosecutors. Prosecutor Greg Andres said, we've been focused sharply for quite some time. He said, Judge, you're not saving time. You're making this case longer. The judge did not appreciate that. He said, judges should be patient. They made a mistake when they confirmed me. Don't try my patience. This is very unusual because these are seasoned prosecutors. CHANG: That's NPR's national Justice correspondent Carrie Johnson. Thanks, Carrie.